TFIID Is a large complex of TBP and 13 TBP associated factors that needs to bind different core promoters and integrate inputs from a variety of transcriptional activators and cofactors. Its structural characterization is extremely challenging due to its scarcity, and extreme conformational plasticity. Using single particle analysis we first obtained a 3-D model of TFIID and TFIID-A-B by negative stain, and located the position of TBP by antibody labeling. We implemented a statistical method to calculate the 3-D variance and covariance of a cryo-EM reconstruction in order to identify mobile regions. We found that a number of discrete structural elements in TFIID move in a concerted manner via hinges in the structure and proposed that this type of conformational versatility is important for its biological function. TFIID is far from being biochemically simple. As an example of the importance of compositional variation in TFIID, it is known that proper ovarian development requires the cell type-specific TAF4b subunit. We obtained a 3D reconstruction of a cell type-specific core promoter recognition complex containing TAF4b and TAF4 (4b/4-IID), which is responsible for directing transcriptional synergy between c-Jun and Sp1 at a TAF4b target promoter. More recently we found that TFIID coexists in two predominant states differing dramatically in the location of the lobe A with respect to a more stable BC core. 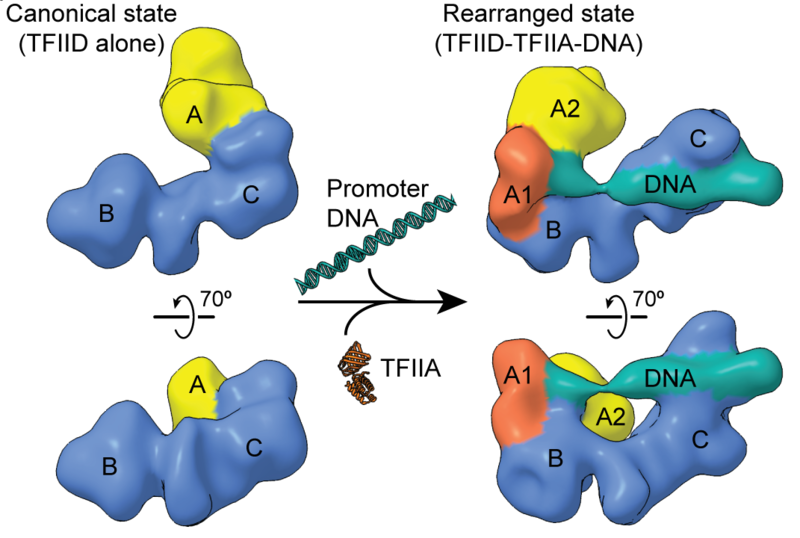 A novel conformation of TFIID, the rearranged state, interacts with promoter DNA in a TFIIA-dependent manner. We found that the downstream region of the SCP is bound by lobe C, while the upstream DNA sequence is bound by TFIID within lobe A. Labeling of TFIIA showed it to bind within lobe A during the structural transition between canonical and rearranged states of TFIID. We propose that the dynamic conformational landscape of TFIID mayhave regulatory consequences within the cell by providing specific structural targets that can be recognized by transcriptional activators and repressors. Since then, and using direct electron detector data and maximum likelihood methodology for our data processing, we have been able to visualize the DNA-bound TFIID structure at sub-nanometer resolution and, through a systematic detective-like process, to generate a pseudo-atomic model of lobe C and its interaction with the INR, MTE and DPE downstream core promoter sequences. First, we localized the position of TBP-TFIIA-TATA DNA by docking the crystal structure at one end of the complex. Using focused classification and alignment to deal with the remaining flexibility present within the BC core, we improved the resolution of lobe C and identified the position of a TAF1-TAF7 complex by docking of its crystal structure. 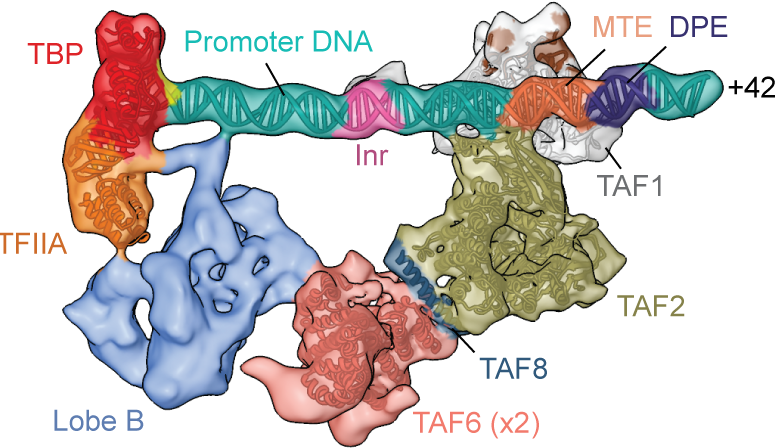 We further recognized that a segment of TAF1 that was flexible and missing from the crystal structure was interacting with the INR motif that includes the transcription start site (TSS), and could dock in a prediction model of this small domain into our density map by this DNA region. Then, a large segment of TAF2 that shares homology with M1 aminopeptidases could be fitted into the lobe C map adjacent to TAF1-TAF7. Within the remaining unassigned region in lobe C, we identified a HEAT-repeat present in two copies, forming an apparent homodimer that could be readily accommodated by fitting two copies of the TAF6 HEAT-repeat crystal structure from a fungi. While resolution in lobes A2 and B was insufficient at the time to make any further subunit assignment, this study already identified, with close to single amino acid precision, the TFIID structural motifs involved in recognition of most human core promoter elements. Nogales, E, Patel, A. and Louder R.K. (2017) Towards a Mechanistic Understanding of Core Promoter Recognition from Cryo-EM Studies of Human TFIID. COSB 47, 60-66. Nogales E., Louder R.K. and He Y. (2017) Structural Insights into the Eukaryotic Transcription Initiation Machinery. Ann. Rev. Biophys 46 , 59-83. Nogales, E, Fang, J. and Louder R.K. (2017) Structural dynamics and DNA interaction of human TFIID. Transcription 8, 56-60. Nogales E., Louder R.K., He Y. (2016) Cryo-EM in the study of challenging systems: the human transcription pre-initiation complex. Curr Opin Struct Biol. 40, 120-127. Cianfrocco, M.A. and Nogales, E. (2013) Regulatory interplay between TFIID’s conformational transitions and its modular interaction with core promoter DNA. Transcription, Transcription 4, 120-126. Cianfrocco, M.A., Kassevitis, G.A., Grob, P, Fang, J., Juven-Gershon, T., Kadonaga, J.T. and Nogales, E. (2013) Human TFIID binds core promoter DNA in a reorganized structural state. Cell 152, 120-131. Grob, P., Cruse, M.J., Peris, M., Inoue, C., Penczek, P.A., Coleman, R., Tjian, R. and Nogales, E. (2006) Cryo-Electron Microscopy Studies of Human TFIID: Conformational Breathing in the integration of gene regulatory cues. Structure 14, 511-520. Andel, F., Ladurner, A. G., Inouye, C., Tjian, R. and Nogales, E (1999) Three-dimensional structure of the human TFIID-TFIIA-TFIIB complex. Science 286, 2153-2156. Commentary on Nature Struct. Biol.